While sharing some elements with the world of motorcycles, for example gears, the Vespa can be considered the forefather of the scooter. Since the Vespa has no crown and pinion and as its wheelbase cannot be varied, it is particularly difficult to make the necessary changes to support every increase in performance with the right ratio"
To solve this problem, Malossi has created the new multiple speed gear for Vespa characterized by a different and more suitable gear ratio, available in two versions, Sport and Racing, and usable by the Special 50 up to the ET3 125. 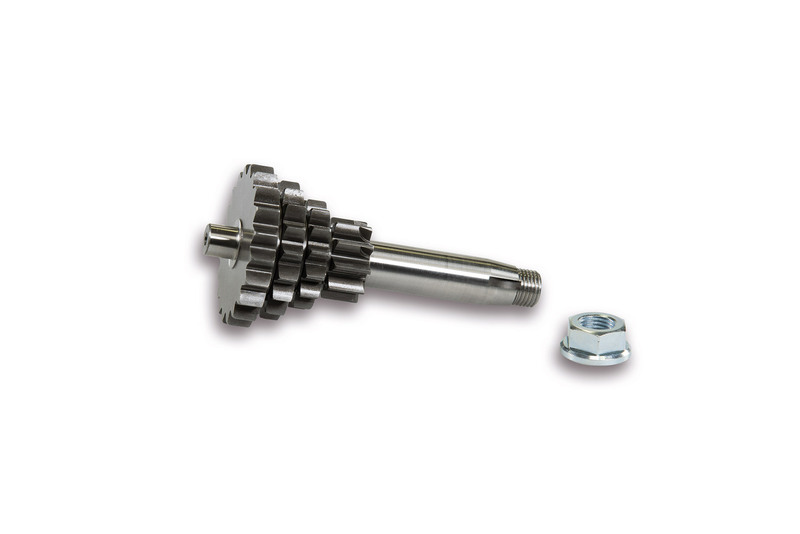 Malossi designers have studies two different ratios for the second, third and fourth gear, calculated specifically for engines more characterized by the torque, in the version Sport 6716696 (Z10-14-17-20 cal15), or for engines prepared for tracks, in the version Racing 6716207 (Z10-15-18-20 cal 15). The Malossi multiple speed gear is perfectly interchangeable with the original and does not require changes to the housing. Moreover, thanks to an obsessive search for the correct dimensioning of the tooth, it is able to operate perfectly in combination with all the other gears. The choice of this precise module, in fact, has made it possible to keep the wheelbase unchanged. This technical solution of great value ensures high reliability and a significant reduction of noise. • Malossi multiple speed gear for Vespa is manufactured exclusively using materials which pass the stringent standards imposed by our technicians, rigidly tested and inspected. • The final process uses digital testing machines, after which Malossi multiple speed gear undergo a compete thermochemical cementation process at 900°C, giving it the required hardness and durability. • Finally, size and quality of the end gear product are checked on a 3D Zeiss testing machine.